One night when I was camping in the woods I went to bed without realizing I hadn’t put away a bag of food hidden under the picnic table. I woke up in the middle of the night to the sound of footsteps outside my tent and I quickly zipped open the door, only to find a couple of heavy raccoons were having a nice feast of my bread and buns. Their keen sense of smell makes them great scavengers, both in the wild and in the city where they dig through trash bins and backyards. The best way to keep these vicious creatures away from your campsite is to make sure there are no scents that would attract them in the first place. Always store your food in the provided bear containers or in the car or RV when you’re done cooking. Leaving food out on the picnic table or inside a tent will invite all sorts of wildlife to join you for dinner. This also includes pet food—never leave the bowl outside overnight. If you’re storing your food in a cooler, make sure the unit is able to lock. Some raccoons have learned how to open cooler lids and even tackle boxes to steal worms. Wash all of your dishes and wipe your picnic table clean of crumbs and food scraps. If you used the grill to barbecue, scrape it off thoroughly when you’re all done. Keep the same precautions in mind as you would to deter bears away from your campsite. Also be mindful of where and how you store your trash. Keep your trash bag inside the RV at night or take it up to the campground dumpster. 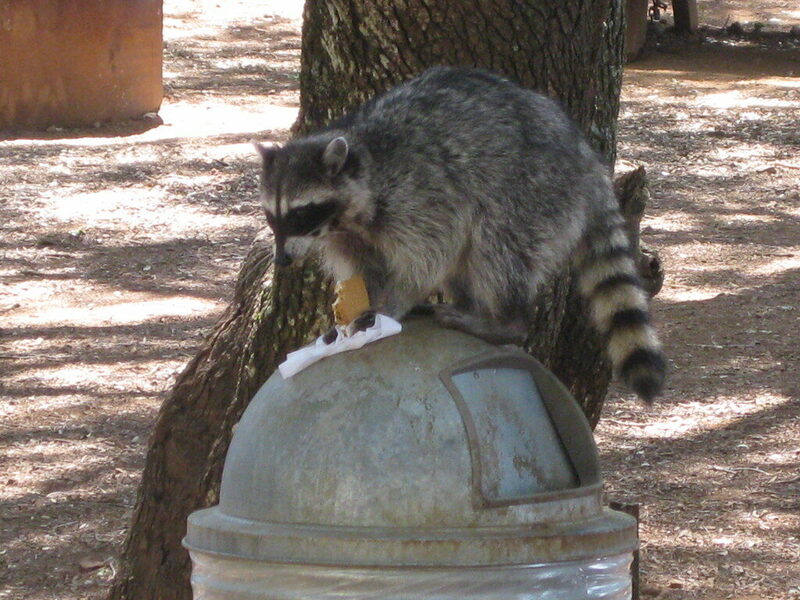 Some raccoons are able to open trash lids and will tear through flimsy garbage bags if left outdoors. Never throw your trash in the fire ring, either. It’s not only bad for the environment, a cause of wildfires, and annoying to other campers—but it can attract raccoons and other animals as well. Keep your campsite clean of food and trash. Photo by Thomas K.
Food and trash are not the only scents that will attract raccoons in your direction. Leave any fragrant soaps, lotions, and other toiletries at home and instead use unscented, biodegradable soap while you’re camping. Brush your teeth in the RV or in the campground restrooms instead of spitting out minty toothpaste in the bushes around your campsite. Strong spices like cinnamon, black pepper, and chili pepper can irritate their sense of smell. Sprinkle some around your campsite to help as a natural deterrent. They’re also known to dislike the smell of fabric softener sheets. Throw a few in your tent or in the trash bag to help mask the food odor. If a raccoon approaches your campsite, shine a bright flashlight at it and make loud noises to scare it away. 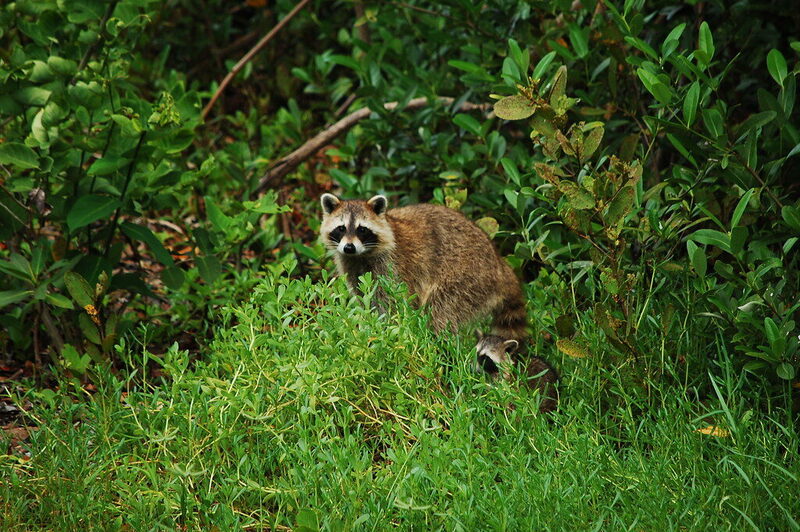 Be careful to keep your distance—the last thing you want on your camping trip is to be mauled by a wild raccoon! An all-natural rodent defense spray can also be used around the campsite and your outside trash bag. It will likewise work in keeping away other rodents like mice and squirrels. Another option is to mount a solar-powered light outside your RV to scare away raccoons, coyote, and other animals after dark.